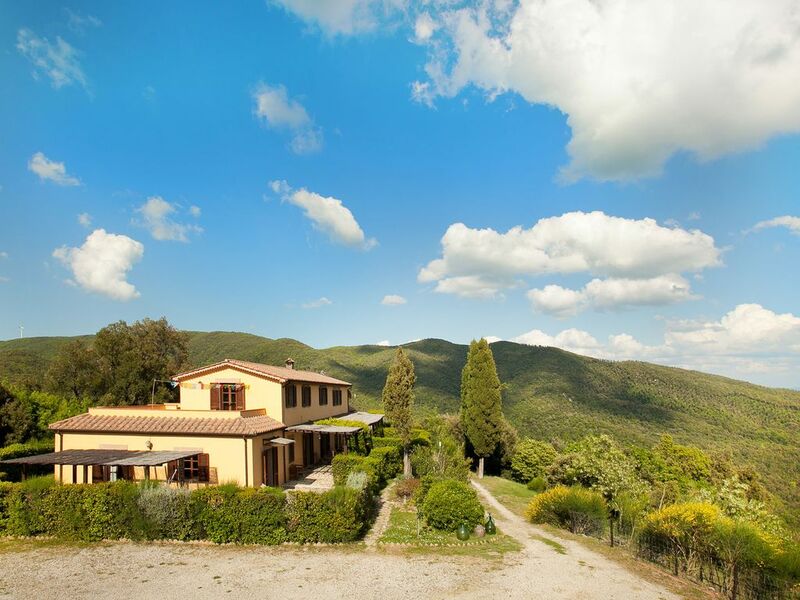 Surrounded by beautiful Mediterranean forest, Casale Pundarika is a Tuscan farmhouse turned into a holiday home and center for courses and retreats. Recently renovated, it is located in a magical place 2 kilometers from the village of Riparbella (PI) on the Maritime Hills a few kilometers from the beaches of the Etruscan Coast. The house has 7 independent apartments and two multifunctional rooms for meditation, yoga, dance and other activities. The house boasts a well-equipped communal kitchen, a communal dining room for groups and a heated jacuzzi. It can be rented by apartment or entirely, for courses or group events and can comfortably accommodate up to 25 people. The house is in a secluded position ensuring maximum privacy and tranquility of our guests. However, the village of Riparbella is only a few minutes by car or even on foot. Guests have access to the forest and its trails, to a magical stream nearby, to a large terrace/solarium with 200 square meters of lawn, hammocks and deck chairs. You can book private yoga classes for individuals or groups, ayurvedic massage sessions, horse riding, wine tasting. Casale Pundarika is a place of peace and contemplation, ideal for those who want to leave behind the stress, the bustle and the noise of our daily life and surrender to the sounds of nature and enjoy life with friends and family . It was formerly a Buddhist center and was chosen precisely due to the particular quality of the surrounding silence and the purity of the air, which made it an ideal place for meditation. Nearby, the Etruscan Coast on the Tyrrhenian Sea offers many types of beaches, sandy, rocky, Family, Dog, naturist and are all easily accessible from the house. This stretch of coastline has been awarded with the Blue Flag by the European Union for the cleanliness of its waters and the quality of services offered. Within a few kilometers from Riparbella, you will find many picturesque medieval villages perched on the hills overlooking the sea or overlooking the Val di Cecina. Among these Montescudaio, Casale, Guardistallo, Bibbona, Castagneto Carducci and the beautiful Volterra. The art cities such as Florence, Siena, Pisa and Lucca are easily reached both by car and by train. In Riparbella and its surroundings you can find some of the best restaurants and wines of Tuscany. We are in Val di Cecina, in the Northern Maremma area, a few kilometers from Bolgheri, world famous for its excellent wine production. In this area the food is mainly based on local products and you can find restaurants for all budgets from small family-run trattoria to starred restaurants. We are a couple managing the Country House and we love to live immersed in an extraordinary natural environment. We like to travel and to host, to cook, to eat good food, laughing and all the other beautiful things in life. We want to share this spirit with our guests and friends. The Riparbella area is renowned for the beauty of its countryside and its proverbial hills, forests, olive groves and vineyards. You can enjoy this extraordinary view through horseback riding, hiking along the nature trails and mountain biking. A Riparbella and surroundings are some of the best restaurants and wines of Tuscany. We are in Val di Cecina, in the Maremma area, a few kilometers from the Etruscan Coast and Bolgheri, famous throughout the world for its excellent wine produced. In this area the food is mainly based on local products and you can find restaurants for all budgets from small family-run trattoria until starred restaurant. The Etruscan Coast 10km away from us on the Tyrrhenian Sea offers many types of beaches, sandy, rocky, Family, Dog, naturist and are all easily accessible from the house. This stretch of coastline has been awarded with the Blue Flag by the European Union for the cleanliness of its waters and the quality of services offered.